Cancellation policy : a penalty of 10% if you notify us 10 days prior to the arrival date and 100% if you notify us less than 72 hours prior to the arrival date. The cancellation must be transmitted to us by email and we have to confirm you the cancellation by email in order to be valid. At arrival a security deposit of 50 eur (only cash) will be asked to prevent any dammage. Recommended in travel guides, Osio has the top two-star rating for its category, as it successfully joins together tradition with all modern conveniences. And with a reputation of warm and personal attention to their guests, Osio also has an excellent reputation for offering clean and comfortable rooms for those traveling on a budget. A small, family run accommodation, Osio is located less than 50 meters from the Mezquita, the central attraction of the historical district; the hostel is quiet and thus guarantees perfect repose. Overlooking either Osio street or the patios, it has 13 rooms with 6 or 4 beds in shared dormitories, one double bed, three beds along closed or open corridors around the patios. They have personal decor and traditional wooden roofs. 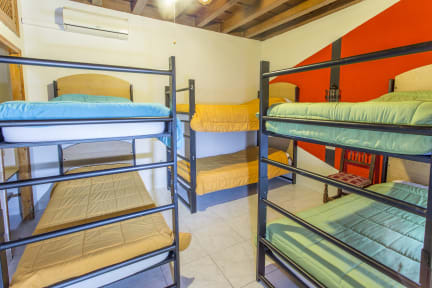 All rooms have a fully-equipped bathroom (with bathtub or shower,) and air-conditioning, heating and TV. Bigger rooms can have extra beds fitted in. Osio Backpackers is in the city of Cordoba, an ancient town with an impressive cultural and architectural heritage coming from the different civilizations which ruled it. Also known as ‘the City of the Three Cultures’, Jewish, Muslim and Christian, it was awarded the title of World Heritage by UNESCO in 1994. This hostel is perfect! Located the middle of the city centre just behind the Mezquita it conserve the typical atmosphere of the town. Services are very good: clean toilet, comfortable rooms, self service breakfast and wonderful terrace to chill :) I absolutely recommend it! Perfect position (you'll be at the Mezquita in 5 minutes walk), nice staff, clean rooms, wide solarium and amazing patio! Ostello perfetto, personale gentile e disponibile! Ottima posizione per visitare la città, pulizia eccellente così come la sicurezza! Consigliato vivamente! The hostel was good! The kitchen a bit small but well supplied. I have been there in winter time and there is no inside chilling room, unfortunately. But during the day or in the summer there are two internal courtyards and a solarium with a nice view. The bed was comfortable and the bathroom inside the room. Bring your own padlock if you plan to use the locker. Ottimi ostello, struttura pulita, bella terrazza, bagni ottimi, letti robusti e personale cortese. Fantastico il servizio di lavanderia molto economico (6kg 4€). Ottima la presenza di prese di corrente sistemate una per letto! Very nice hostel in Cordoba. I found the receptionist very kind. The position is optimal to visit the city center (100 m from the cathedral). Very quiet during the night. Free breakfast in the morning and a terrace with a nice view of the old city. The room was clean. I recommend this hostel. L'ostello è proprio nel cuore di Cordoba, in una posizione strategica per raggiungere tutti i punti della città. Ha dei meravigliosi patii interni come spazi comuni mentre la cucina e un po' strettina. Stanze rustiche, senza molte comodità. Nel complesso consigliato. Un buon ostello, pulito e confortevole, con una bella terrazza (non molto sfruttabile a dicembre, ma piacevole). Personale 24/24 disponibile. Tante le cose da migliorare.. Il pavimento finto erboso della terrazza era sporco, qualche cicca, nonostante le pattumiera presenti, a pulire solo una signora molto cordiale ma super super impegnata perché da sola a rassettare pulire riordinare fare la lavatrice per me ecc.. Colazione offerta nel costo della permanenza, basica ma abbondante, palazzo d'epoca davvero suggestivo,la mia camera piccola, angusta, bagno cieco con tre letti a castello.. Nel complesso ok da organizzare meglio.